This CD is one of the major stepping stones of Eric Clapton's brilliant career. It is here where Eric learned how to play the blues. This is where he paid his dues, so to speak. To me many of the songs hold up to this day and in some ways are even better than some of the songs he did with Cream. Many of the songs on Cream albums are not blues, instead its trendy rock and to me a lot of it now sounds dated. The 4 songs on this album to me that are worth listening to are "All your love". Another personal favourite and one I still enjoy very much to this day is "Hideaway". Hideaway is a classic text book Eric Clapton song. The third song of note is "Ramblin on my Mind" which was the first time Eric sang vocals on a album. To me this makes the CD monumental. And finally "Steppin Out" which also appears on the second Live Cream album. These 4 performances are very solid and stand the test of time. May I suggest the John Mayall 70th Birthday celebration in which Clapton performs with Mayall for the first time in over 30 years. Seeing the two back together is well worth the watch and the listen. Get the CD and the DVD! Just fantastic, the sound is brilliant. You listen from beginning to end and then as it goes quiet you think to yourself "wow". It's a rare album that does that to you. EC plays so well on these tracks it amazes me every time I listen to it. Top notch! In my opinion this is the best white blues album of the sixties. But only when talking about the tremendous guitar efforts. The best on here are All your love (covered by Gary Moore much in the same way), Little girl, Key to love, Double crossing time and the two instrumentals. I find Parchman farm and Another man totally unnecessary, Have you heard is great but not that great because of poor vocal delivery by Mayall, the same goes for What I'd say with unnecessary drum solo, horrible vocals and stolen Beatles riff. BUT MAN I NEVER HEARD SUCH A TOUGH SHARP TUNE ERIC HAS GOT HERE!!! 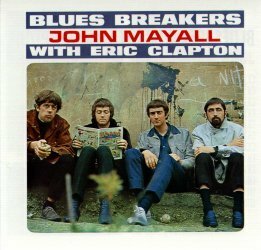 Few albums have had greater impact than John Mayall's 1966 landmark "Blues Breakers With Eric Clapton." Released by the Decca label in Britain on 22 July 1966, literally days after Clapton left the Bluesbreakers and just a week before Cream's debut, it went all the way to #6, a pretty mean feat, since Mayall's band had never had a hit single. This may have been a first in Britain. Of course, this is the album that set the blues and guitar worlds aflame and established Eric Clapton's name worldwide as the most passionate of musical interpreters. If you haven't yet heard "Beano" -- as it is affectionately known, because Clapton is pictured reading a "Beano" comic book on its cover -- then you ain't heard nuthin' yet! This is the stuff of legends. From the album's first notes, you realize that you're in guitar heaven, as "Slowhand" shows us the way electric guitar can and should be played. Clapton's virtuoso playing is white hot throughout. Playing with a maturity beyond his 21 years, the young Eric Clapton so influenced the guitar world that Gibson eventually reissued the Les Paul model -- out-of-production since 1960 -- which Clapton then played. John Mayall's Bluesbreakers served -- and serves still today -- as a finishing school for great musicians and sidemen (Clapton, Peter Green, Mick Taylor, Walter Trout, Coco Montoya, John McVie, Jack Bruce, Aynsley Dunbar, Mick Fleetwood and others). Mayall's proselytizing the blues (he's 70 years old! ), his song writing skills, and his other musical talents should not be ignored nor taken lightly. In the late 60's a classmate of mine talked about a new record he had bought, John Mayall and the Bluesbreakers with Eric Clapton. I didn't pay much attention to that, because those days I only listened to Beatles and Swedish Pop Music like Hep Stars, Shanes and so on...today, almost 40 years later I finally have the record in my player. Ok, it's a CD and not a vinyl, but I'm enjoying every minute I listen. This is definitely the blues album that everyone HAS to get. This is probably one of Clapton's best albums, especially since John Mayall's style allows him to stretch his blues repertoire to its maximum. He really lets loose and blows us away with great solos on Hideaway, Steppin' Out, and Key to Love. The songs on this album however do lack Eric Clapton's great voice which really compliments his guitar later in his career. It is however still one of the greatest blues albums of all time. This is a bit sketchy at time but overall a very good blues album. Shows Clapton in his early 'stages' of learning blues guitar, though keeping it in with rock which is his unique style, a style that makes him stand out from other guitarists. Definitely a good album, great work by Eric (It's amazing how good he was back then!!) Great rhythm section. The only thing I'm not too crazy about is Mayall's singing, he sings weird, and I don't really like the harmonica fortes he does with just him playing with no one else in the studio. I haven't really heard to much of this record, but from what I've heard, it's incredible. My favourite is "All Your Love" (An Otis Rush cover.) It's fun, depressing, upbeat, and sad again. I love the guitar line. If you listen to this album you see who Stevie Ray Vaughan was influenced by, (He does a version of "All Your Love" on "In the Beginning where you hear his influence from Clapton.) There are lots of other great songs like "What'd I Say," (a Ray Charles cover) "Hidaway" (Freddy King) and "Steppin' Out" (L.C. Frazier.) If you're a blues or Clapton fan, you must have this. I have been a fan of Slowhand for more years than I care to remember. Everyone loves to talk of the man's ability with a guitar, I have got to say this track is not only a masterpiece of Eric's feeling for the blues the vocal is so lost in the blues that you can feel the pain. This is a must for ever blues guitar player and Clapton fan! This album justified the famous "CLAPTON IS GOD" slogan. When this piece of art was released no one knew that the guitar could be used to that effect. standard very high. Another Man, Double Crossing' Time (Mayall/Clapton written song about Jack Bruce leaving the Blues Breakers), Ramblin' On My Mind (first recording of Eric on lead vocal) and It Ain't Right. It's just as good as music possible can be! They're doing a great job covering the Ray Charles tune What I'd Say, and actually stealing The Beatles' riff from their 1965-single Day Tripper. The only let down on this album is presented in What I'd Say, in the form of an totally unnecessary drum-solo, otherwise no complaints on this album. Have You Heard has got to be Eric's greatest solo up to that point, and through the album you really can hear how much he has developed since his days with The Yardbirds. Parchman Farm has some great harmonica delivered by Mayall and there's a great version of Steppin' Out, later to be a favorite to perform live by Cream. If you like blues and great guitar-playing, you should really get this album as soon as you find it. It's one of the best in my collection!